Mother Teresa of Calcutta was a Roman Catholic nun and founder of the Missionaries of Charity. In 1979 she was awarded the most prestigious prize in the world, the Nobel Peace Prize, for her humanitarian work. Her labor made her so worthy that, in reality, she gave honor to the prize, rather than the other way around! Agnes Gonxha Bojaxhiu was born in 1910 to Albanian parents in Skopje, which at the time was under the rule of the Ottoman Empire. (The city is now the capital of the Former Yugoslav Republic of Macedonia.) When she was 18, she entered the Order of the Sisters of Our Lady of Loreto in Ireland. She trained in Dublin and in Darjeeling, India, before taking her religious vows in 1937. 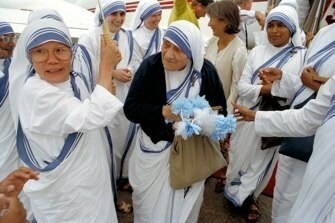 She took the name Teresa from Saint Teresa of Lisieux, the patron saint of foreign missionaries. In September 1946, while riding in a train from Calcutta to Darjeeling to engage in 8 days of spiritual exercises, she received a divine calling from God "to serve Him amongst the poorest of the poor". She served as principal of a Roman Catholic high school in Calcutta, and was moved by the presence of the sick and dying on the city's streets. In 1948 she was granted permission to leave her post at the convent and begin a ministry among the sick. That same year she became an Indian citizen. In 1950 Mother Teresa and her associates were approved within the archdiocese of Calcutta as the Missionaries of Charity. The order was later recognized as a pontifical congregation under the jurisdiction of Rome. Members of the congregation take four vows on acceptance by the religious community. 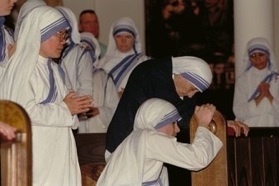 In addition to the three basic vows of poverty, chastity, and obedience, a fourth vow is required pledging service to the poor, whom Mother Teresa described as the embodiment of Christ. 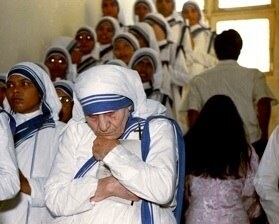 In 1952 Mother Teresa opened the Nirmal Hriday (Pure Heart) Home for Dying Destitutes in Calcutta. She and her fellow nuns took in dying Indians off the streets of Calcutta and brought them to this home to care for them during the days before they died, so that they might be able to die in peace and with dignity. In serving the people abandoned by society, Mother Teresa put love into action. Her spirit of giving inspired many to follow her, and her work eventually expanded to many other parts of the world. Today over 5000 sisters, brothers, and volunteers run approximately 500 centers worldwide, feeding 500,000 families and helping 90,000 lepers every year. In recognition of her efforts, Mother Teresa was bestowed many awards, including the Padma Shri award for distinguished service in 1962, The Pope John XXIII Peace Prize in 1971, the Nobel Peace Prize in 1979, the Presidential Medal of Freedom in 1985, and the Congressional Gold Medal in 1997. Mother Teresa accepted all awards on behalf of the poor, using any money that accompanied them to fund her centers. 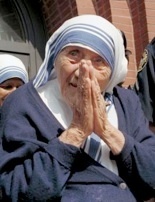 Mother Teresa was forced to scale back her activities in 1990 because of declining health. On March 13 1997, she stepped down as head of the order and Sister Nirmala was chosen to succeed her as leader of the Missionaries of Charity. On September 5, 1997, at the age of 87, the best loved woman of the century passed away. Her funeral service was on September 13, 1997, the 51st anniversary of her receiving her divine mission from God.